Magnetic separation is an old technique for the concentration of iron ores and for the removal of tramp iron. Since 1849, a number of patents on magnetic separation have been issued in USA, and texts of some of the patents before 1910 describe a variety of magnetic separators for mineral processing. 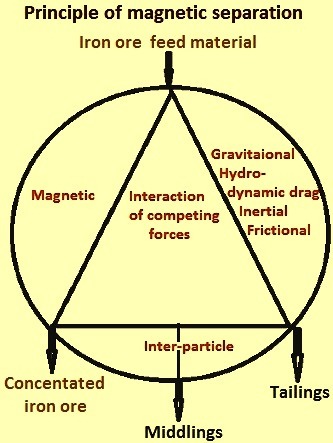 Magnetic separation is a physical separation of discrete particles based on the three way competition between tractive (i) magnetic forces, (ii) gravitational, hydro-dynamic drag, frictional, or inertial forces, and (iii) attractive or repulsive inter-particle forces. These forces combine to act differentially on particles of differing magnetic properties in the feed material. Fig 1 shows the principle of the magnetic separation. The forces in the magnetic separators which compete with the magnetic forces and act on all of the particles which travel through the separator are those of gravity, hydrodynamic drag, friction, and inertia. Depending on the type of magnetic separator, certain of these forces can have higher or lesser importance. The gravitational force is significant for large particles while the hydrodynamic drag force is significant for the small particles. Thus in the magnetic separator which treats large particles in dry form, the feed material passes through the force of gravity. The magnetic forces need to be sufficient to hold the magnetic particle against the competing force of gravity. In a wet separator for small particles, the magnetic force need to be larger than the hydrodynamic drag force which is applied by the slurry stream on the trapped particles. The competition between the magnetic force and the competing forces in a magnetic separator determines the likelihood of a magnetic particle being trapped or recovered in the magnetic separator. The inter-particle force, those between magnetic and non-magnetic particles, determines the concentration of the products of the magnetic separation. If the force between the particles is larger than the magnetic and competing forces, then many non-magnetic particles are likely to be trapped along with the magnetic particles. On the contrary, many magnetic particles can be carried along with the non-magnetic particles and can fail to be trapped. In order to achieve high recovery of magnetic particles, the magnetic separating force is to be greater than the sum of the competing forces. If, however, magnetic force is much greater than the competing force, selectivity of separation is poor, as no distinction is made between various magnetizable particles. The selectivity of the process is to be critically determined by the relative values of the magnetic and competing forces which are affected by a correct choice of a separator itself and its operating parameters. The operative magnetic, competing, and inter-particle forces determine separator performance. These forces are dependent on both the nature of the feed to be separated as well as the characteristics of the magnetic separator. The nature of the feed includes its size and physical properties which can affect the various forces involved. The characteristics of the magnetic separator includes the design and its variable parameters, particularly the magnetic field and the process rate. There exists a general relationship between these parameters. Also, the magnetic force in a separator can be maximized by matching the magnetic field gradient to the particle size. Magnetic separator separates the iron ore feed material into two or more components. If the purpose is to produce a magnetic concentrated iron ore then the other component which is non-magnetic is the tailings. In some cases there can also be a possibility of separating the less magnetic third component which is called middlings. Each of these material streams are to be transported into, through the separator, or out of the separator. The magnetic and competing gravitational, friction, hydrodynamic drag, or inertial forces tend to separate the particles while the attractive inter-particle forces tend to reduce the degree of separation. In any real situation for separation both magnetic and nonmagnetic particles are also normally found in the tailings, or middlings, and only in the limiting case the complete magnetic separation is possible. The magnetic separation efficiency is usually expressed by both by the recovery (the ratio of magnetic material in the concentrated ore relative to that in the feed material), and the grade (the fraction of magnetic material in the concentrated ore). These are the two normally used independent measures for the effectiveness of the magnetic separator. These measures depend on the relative magnitude of the tractive magnetic forces, gravitational, hydrodynamic drag, frictional or inertial forces, and attractive or repulsive inter-particle forces. In magnetic separation, though the conditions of efficient separation are clearly defined, there is a complication since the relative importance of the forces is determined mainly by the particle size. This is mainly since the competing forces have the dependence on particles size. In dry magnetic separation, the drag force has usually a negligible effect on the particle size and hence, as a rule, does not have considerable affect the efficiency of separation. On the contrary, the particle size has significant dependence on the magnetic force and the gravitational force during dry magnetic separation. On the other hand, in wet separation where the hydrodynamic drag force can be important, selectivity of the separation is considerably influenced by th particle size distribution. With decreasing particle size the relative importance of the hydrodynamic drag increases in comparison to the magnetic force. In the design of a magnetic separator, it is necessary that besides a field, a gradient in the field strength is also to be provided to enhance movement of particles in the desired directions. In a field of uniform magnetic flux, magnetic particles converge at the flux and orient themselves so that there is a concentration in its body but it does not move. On the other hand, by producing a converging field, there is a resulting pull on the particles towards the higher flux area. The magnetic field and field gradient which act on the particles in all magnetic separators can be produced in a variety of ways and result in widely varying field geometries and strengths. In some cases, permanent magnets produce the fields directly while in other cases coils and iron magnet circuits are used to magnetize a ferromagnetic structure whose field gradients attract the magnetic particles. There are different types of magnetic separators which have been designed to enable the required magnetic field based on the ores to be beneficiated along with other criteria. Magnetic separators are broadly categorized into two groups namely (i) low Intensity, and (ii) high Intensity. Both the groups can be of either wet or dry operation type. Some of the types of the magnetic separators which are in common use are (i) wet and dry, low intensity magnetic separation (LIMS), (ii) high gradient magnetic separation (HGMS), (iii) wet high intensity magnetic separation (WHIMS), (iv) roll magnetic separators for processing weak magnetic ores, and (v) induction roll magnetic separation (IRMS) for concentrating dry ores. The magnetic field is usually generated by one of the several ways such as (i) permanent magnet, (ii) electromagnet with iron yoke, (iii) solenoid and (iv) superconducting magnet. Magnetic separation operations are often categorized as either low or high intensity. 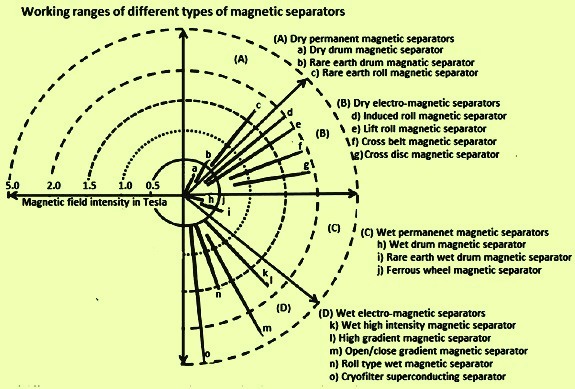 Low intensity separators use magnetic fields ranging between 0.1 Tesla to 0.3 Tesla. Low intensity techniques are normally used on magnetite ore as an inexpensive and effective separation method. High intensity separators employ fields as strong as 1 Tesla to 2 Tesla. This method is used to separate weakly magnetic iron ores such as hematite, from non-magnetic or less magnetic gangue materials. Other factors important in determining which type of magnetic separator system is to be used include particle size and the solids content of the ore slurry feed. Magnetic separators are generally grouped as dry/wet low-intensity magnetic separators, dry/wet high-intensity magnetic separators, and high gradient magnetic separators. The groupings based on the magnetic field intensity are shown in Fig 2. In addition, there are few separators, which also account under dry high-intensity group, such as permanent roll magnetic separator, isodynamic separator, open gradient magnetic separator, vibrating high gradient magnetic separator/filter, and superconducting high gradient magnetic separator. High intensity dry magnetic separators have higher magnetic field strength imparted either by a permanent magnet or through an induced magnetic field to separate the particles based on their magnetic susceptibility. 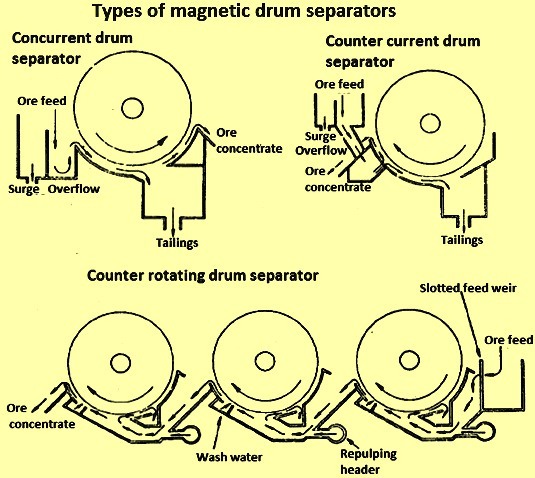 Though there are several groupings of magnetic separators, principle of separation by two types of separators (drum, and high intensity) are described here. The drum separator is representative of conventional low gradient magnetic separator. In such separator (Fig 3) the dry feed material is introduces at the top of a rotating drum. The ore particles are carried downward along the drum by the combined action of gravitational and frictional forces which transmit the rotation of the drum to the particles. Magnetic forces produced by the stationary magnets within the drum hold the higher magnetic particles against the rotating drum. These particles are deposited to the right as the drum moves past the end of the magnets. The nonmagnetic particles fall freely off the drum to the left. Such a separator can use either permanent magnets or electromagnets. Magnetic separators similar to these are widely used for the beneficiation of magnetite-bearing iron ores. Fig 3 also shows the schematic representation of the high intensity magnetic separator. In this high gradient magnetic separator, a magnet designed to produce a strong adjustable field in the container volume is used. This volume is packed with a matrix of filamentary, ferromagnetic material. Strong magnetic forces produced by the high field gradients at the edges of the filaments are effective in trapping very fine (less than 100 micron) particles of even weakly magnetic substances. These filaments are chosen to match the size of the feed particles in order to optimize the magnetic forces. The iron ore feed, in fluid (usually water) slurry, is passed down through the container. The fluid and non-magnetic particles pass easily through the relatively open structure of the matrix. The trapped magnetic particles are easily washed out when the applied field is reduced to zero. Magnetic separators of this type are useful for the concentration or removal of fine magnetic particles when processing of iron ore for pellet feed. Magnetic separators are integral part of the low grade iron ore beneficiation systems. Roasting of low grade iron ores to increase their magnetization (i.e. hematite to magnetite conversion) extends the applicability of conventional magnetic separators. Magnetic separators are also used in certain iron recycling applications. There are several types of magnetic separators which are being used for iron ore beneficiation. The most common are the dry and wet drum separators which are being used for the beneficiation of iron ores. Induced roll separators are used to treat weakly magnetic iron bearing ores, while pulley separators are most often used in the removal of tramp iron from various feeds. These separators are using either permanent magnets or electromagnets and operate in a continuous mode. Drum separators and high gradient magnetic separators are described in some detail below. Drum separators – Drum separators of many types are perhaps the most common type of magnetic separator which is being used. These types include pulley, dry drum, wet drum, and induced concurrent, counter-rotating, and the counter-current types roll separators. Dry drum, induced roll, and pulley separators operate similar to the separator shown in Fig 3 and described earlier in the article. The dry feed is thrown off one side or the other of the drum or pulley depending on the relative magnitude of the magnetic, centrifugal, or gravitational forces acting on the particle. With these types of separators, it is possible to recover a middling fraction. The middlings particles are weakly attracted by the magnetic force than the concentrate particles and hence are made to fall into a bin between the concentrate and tailings bins. These middlings are generally consisting of partly liberated particles containing both magnetic and non-magnetic components. Since grinding of ores is expensive, it is frequently economically attractive to treat the ore initially with a dry drum separator and regrind the middling fraction before retreating it magnetically. Dry drum separators are being used to treat particles as small as 100 microns. The performance of these separators in producing concentrates is strongly affected by the moisture content of the feed ore. If the moisture content is high, small particles can stick to the bigger particles resulting in a less complete separation. Since the non-magnetic drum in Fig 1 turns past the stationary poles of the magnets within the drum it can be seen that a magnetic particle experiences a force of varying magnitude as it rides on the surface of the drum. This variation in the strength of the magnetic force can produce a tumbling motion of the trapped particles which aids in their separation from the unwanted non-magnetic particles. The reversal of the magnetic field between magnetic poles also results in a rotation of particles with remaining moments. The specific motion of the particle is strongly dependent on the particle size. There are three major types of wet drum separators (Fig 4). These are (i) concurrent, (ii) counter-rotating, and (iii) counter-current types. The magnets in the drums are like those shown in Fig 3 and cover around the same arc as the rotation-indicating arrows. In the concurrent drum magnetic separator the feed slurry is passed through the trough in the same direction as the rotation of the drum. Magnetic particles are attracted to the rotating surface of the non-magnetic drum by the stationary magnets within the drum. The non-magnetic particles sink to the lowest point in the trough and are drawn off as tailings. The magnetic concentrate is carried by the rotating drum up over the weir to the right. This type of separator produces a high grade concentrate for particles on the order of a few millimeters in diameter. The separation is relatively clean since the magnetic particles are affected by the competing magnetic and hydro-dynamic drag forces all along the periphery of the drum. This cleaning occurs even though the variation in force due to the alternating poles within the drum does not produce the same degree of particle motion on the drum as is seen in the dry separator where the viscous forces of the slurry are not present. Since the concurrent tank separator often produces tailing in which a relatively large amount of magnetic material remains, the tailings are often retreated in a counter-rotating drum separator. The counter-rotating separator is shown in Fig 4. The feed is passed through the trough opposite to the direction of the drum rotation. The magnetic particles are picked up on the surface of the drum and carried up to the left. This separator produces a high recovery but generally of a low-grade concentrate since most of the magnetic particles are trapped in a short section of the drum and there is little opportunity for the material of the trapped particles to release entrained nonmagnetic particles. The high recovery also results from the opportunity of particles to be picked up further downstream by the drum and be carried back as concentrate. Such a separator normally treats particles down to 100 microns. Because of its ability to pick up magnetic particles not immediately entrained, this separator has a larger capacity than the concurrent type. The third type of magnetic wet drum separator, the counter-current drum, is often used as a finishing separator because it produces an extremely clean concentrate with good recovery for particles down to around 70 microns. This separator retains some features of both the concurrent and counter-rotating types. This separator is shown in Fig 4 as a 3 drum tandem separator. In this separator the feed is introduced at around the midpoint in the magnetic section of the drum. The flow of the feed slurry is opposite to the direction of the drum rotation while the entrained particles travel in the same direction. These entrained particles are washed by water introduced on the left side of the tank. The cleaned concentrate is overflowed to the left. A feature, common to all wet drum separators is the overflow of the concentrate slurry at the end of the tank. This is desirable to prevent the magnetic particles from being drawn through the air-water interface and the resulting loss of magnetic particles. In some of the separators in which a dewatered concentrate is desired, the magnetic particle are drawn up above the surface of the slurry and scraped off the drum. In these cases the slurry is to be recirculated to recover the lost magnetic particles. The major competing force in a wet drum separator, however, is the force of hydrodynamic drag. This results from the relative velocity of the slurry or wash water which passes by an entrained particle. In the concurrent separator this velocity is around the peripheral velocity while in the counter-rotating separator these velocities are added. In general, the peripheral drum velocities are considerably higher than the slurry velocities. In addition to its effect on the relative drag velocity, the drum speed also affects the capacity of a drum separator. A slower speed results in a reduced capacity while a higher speed decreases the recovery due to higher drag velocities and result in greater wear of the drum surface. Some of the magnetic separators are being called high intensity separators. This generally designates separators of conventional design employing magnets of greater strength than usual. They develop high intensity magnetic fields and are capable of removing particles which do not respond to the low intensity magnetic separator. Several types of high gradient magnetic separators have been developed based on the fact that high magnetic field gradients can produce large magnetic forces. These separators are also called ‘induced pole’ separators because the field gradients are produced by applying a relatively uniform background magnetic field to a ferro-magnetic structure (grids, screens, grooved plates or steel wool) and inducing magnetic poles along properly oriented edges. Since large magnetic field gradients can generally exist only in small volumes these separators are designed for the separation of small magnetic particles. Producing high gradients and large magnetic forces over a surface area large enough to trap practical numbers of particles is a major issue. Needles with their axes parallel to the applied field produce high gradients in relatively low fields but the available trapping surface is very limited. By contrast filaments magnetized perpendiculars to their long axis have a large demagnetizing factor, but much greater surface area.